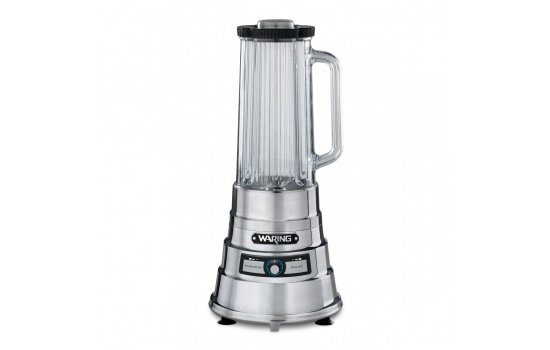 Waring manufacturers an extensive series of high-performance blenders for use at home. Models include Specialty Blenders, Food & Beverage Blenders, and Bar Blenders. By choosing the right type of Waring blender to match the application you can easily whip up a delightful smoothie, sauce, soup, or drink. The latest blender model offered by Waring is the Inverted Blender which has variable speeds to simplify the process of liquefying ingredients for dips, specialty cocktails, and smoothies. To make sure the blender is able to easily blend down the fruits and vegetables it comes with a powerful 1200 watt motor that offers the choice of speed control and pulse action. The large size carafe is at 56 oz. is made in BPA-free copolyester which makes it easy to clean and use. The Inverted Blender has been designed with a unique shape to make it more efficient at juicing the raw ingredients and getting the maximum out of the machine. An attractive and stylish look comes with the stainless steel construction, which is certain to look great on any kitchen countertop. Use this blender for meringues, whipped cream, hummus, bar drinks, and smoothies. A high-end blender like the MegaMix is certain to help with all-types of liquefying duties. This high powered blender is easily able to blend down frozen drinks, smoothies, sauces, and soups to complete perfection. The motor is rated at 1.5 HP with 2-speeds to give enough performance to achieve the desired results. The MegaMix is constructed in brushed stainless steel (also comes in black) to offer a highly attractive option to sit on the kitchen countertop. For high strength and durability, the carafe comes in polycarbonate and accepts 48 Oz of liquid and ingredients. When you want the extreme blender that gives consistent results go with the Waring Pro XTREME™ Blender. This blender gives a solid and reliable performance with a 64 oz. jar and powerful performance to easily create the perfect dressings, desserts, spreads, frozen drinks, and smoothies. This blender gets the largest jobs done to a satisfactory standard and has a motor with 30,000 RPM. Its jar comes in polycarbonate BPA-free which is virtually unbreakable. Easily adjust the speed from 1,500 RPM up to ensure the right performance is given for the specific type of blending. Even though this blender is powerful it still has a quite compact footprint at 8.5 inches x 8.5 inches x 19.5 inches. The stylish Stainless Steel Blender is built to provide a vortex action which is appreciated for its ability to work fast at grinding down the raw ingredients. This blender has a high-performance and a commercially rated motor with a decent size container at 32 Oz, which is certain to be more than enough for most at home applications. It also comes with a simple-to-use 2 speed control and 550 peak watts. The MegaMix just does everything, thick or thin soups and smoothies are no problem. It looks classy on the countertop but the price is quite high. MegaMix is perfect for those that often blend a varied mix of fruits or vegetables to produce the breakfast smoothie.